Killer Characters: What's A Bad Boy To Do? What's A Bad Boy To Do? My name is Beaumont P. Lincoln, but my friends call me Beau. I suppose you could call me a rake. What can I say? I like gorgeous women and will do whatever I have to for their attention. Of course, it helps that I’m filthy rich and I own a multimillion dollar pastry conglomerate called Sinfully Sweet which makes unbelievable desserts with a kick—a.k.a. liquor. I’ve been known to use these delicious confections to lure beautiful women to my bed. Did I mention that I have a gorgeous wife who likes her alcohol on the rocks? 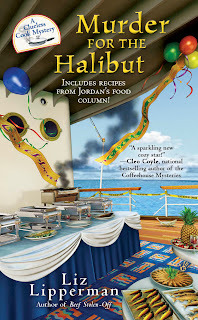 I came aboard the Carnation Queen to judge the Caribbean Cook-Off with Jordan McAllister, the clueless culinary reporter from my old hometown in Texas and George Christakis, a top chef who rubbed me the wrong way. I tried every trick in the book to woo Jordan, but she wanted nothing to do with me. With her addiction to Hostess Ho Hos I thought for sure my killer Kahlúa brownies would reel her in. But it was not to be. So I turned my attention to one of the contestants, and boy did my wife pitch a fit on stage one night because of it. Now that was a scary sight, but it still didn’t stop me from doing what I do best—being obnoxious. You’ll have to pick up a copy of MURDER FOR THE HALIBUT to find out how this bad boy made out on the cruise. Did he get the girl—or did the girl get him? But because you all are so sweet, he agreed to share the recipe for Kahlúa brownies. Enjoy. Preheat the oven to 350° F. In a large bowl, combine the cocoa and baking soda. Blend in 1/3 cup of melted butter. Add boiling water and Kahlua and stir until well blended. Stir in sugar, beaten eggs, vanilla, and the remaining 1/3 cup of butter, then the flour and salt. Add the nuts and chocolate chips and pour the batter into a greased 13x9x2-inch baking pan. Bake for 35-40 minutes or until chocolate brownies are firm and begin to pull away from sides of pan. Cool before cutting into squares. Lol, I guess being obnoxious makes you the murder victim. If not in this book, then perhaps the next. You better get your act together and stay faithful to your wife. I am looking forward to reading the book and finding it all out. Yum! Thank you for the recipe! Thanks for the recipe. Looking forward to making it for my book club this week. Thank you for the recipe, sounds delicious. Aurian, you tell him!! There's something about killing obnoxious people that I like. but guess what? Beau isn't the one who dies in the competition. He gets to fool around the entire book. That doesn't seen fair. Let me know how you liked it. Wilow, Dianne and Ingeborg. I hope you enjoy the recipe. I, personally, have never made it, but I have had a Kahlua bundt cake that was to die for. I'm definitely trying this one, too. Wow. Love Kahlua. I'd like that Bundt cake recipe, too, please! I think those brownies sound absolutely wonderful. Annette and Krista, I can't wait to make them. I'll send the bundt cake one, Krista. That's yummy.